Flat Jardim de Alah is 12 km from the city center, 15 km from the airport, 2 km from the convention center, 2 km from the air club. Facing the sea 100 meters from the beach, 7 km from the main avenues of the Bahia carnival (Ondina and Barra). Inside the flat, we have Portuguese restaurant (The world of Bacalhau), Pizzeria, shops of articles and clothes, beauty salon, pharmacy, shoe store, bar and convenience store and etc.The Garden of Alah is one of those beaches to be dazzled. This is a peculiar postcard inside Salvador .. The beach is within the neighborhood of the Costa Azul and is ordered by beautiful coconut trees and lawns. In addition, it is located on a small cliff, which favors a stunning visual is an invitation to practice sports, is one of the neighborhoods with the best infrastructure of the capital of Bahia. On the lawn, it is possible to have a picnic with the whole family, for those who prefer a physical activity, the tip is to enjoy the boardwalk for a walk or a jog. The Parque Costa Azul, with an area of ​​55 thousand square meters, offers all the infrastructure for those who are fond of sports., Space with soccer field, exercise equipment, two playgrounds with bike racks, cycle lanes and jogging lanes at different levels The park also has an amphitheater, a light source, a parking lot with 150 parking spaces, a nursery of plants and two colored panels by the plastic artist Fernando Coelho. The park itself hosts a variety of restaurants to replenish the lost energies. There are international, typical food, pasta or meat options. The neighborhood, by the way, is well served by houses, such as Baianow, with its typical foods, or Chalezinho. The Flat Garden of Alah also makes life easier for those who just want to taste a drink at one of the waterfront kiosks and contemplate the look. In addition, the tourist is very close to the sights of Salvador. 15 km from the center, it is possible to visit Pelourinho, Elevador Lacerda, Barra, among other charms of the Bahia capital. Estadia foi ótima do inicio ao fim. Sugiro só melhorar a cama de casal, a mesma e um pouco rígida não trazendo muito conforto. o restante tudo excelente. A recepção da Luzia foi sensacional, sempre com solicitude, paciência e disponibilidade para resolver qualquer solicitação. Foram raras pendências ao longo de 3 meses e todas elas independeram da vontade de Luzia. Tudo que foi acordado e oferecido quando da contratação foi executado e disponibilizado. 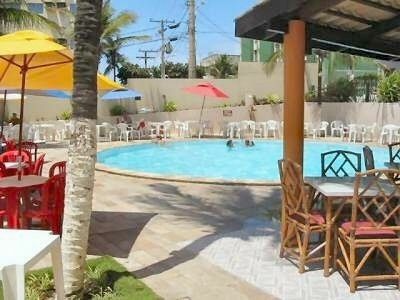 A localização é excelente com supermercado, farmácia, restaurantes, pizzaria, estúdio de pilates, academia e praia muito próximos. Recomendo e, com certeza, retornaria. Minha estadia foi maravilhosa. O flat é bem equipado, limpo, tem uma vista ótima, bem localizado. Lúcia e Lúzia são super agradáveis! Recomendo. Muito Obrigada e volte sempre vai ser sempre bem vinda!